GT6 Concept Movie #4 "Vision Gran Turismo"
Polyphony Digital Inc., creator of PlayStation®’s best-selling Gran Turismo® franchise, has announced a unique partnership with a number of leading automotive manufacturers, design houses and other leading global brands. Design teams from Alfa Romeo, Alpine, Aston Martin, Audi, BMW, Bertone, GM Design, Honda, Infiniti, Italdesign Giugiaro, JORDAN Brand, Mercedes-Benz, Nike, Nissan, Peugeot, SRT(Chrysler), Volkswagen and Zagato will create concept models giving a unique insight into the future of the automotive sector. Their designs will then be recreated as working cars for the new Gran Turismo®6 game due for release on 6th December, 2013. 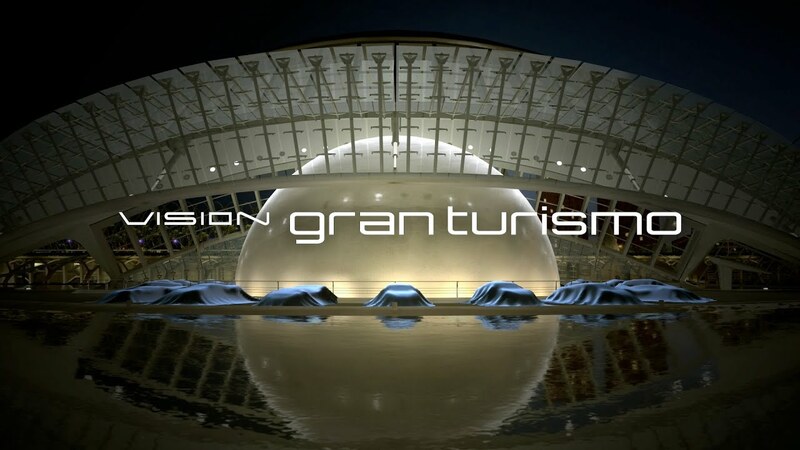 The initiative celebrates 15 years of the 70-million-selling franchise and is known as "Vision Gran Turismo". Vision Gran Turismo will include cars such as the BMW Vision Gran Turismo, an exclusive virtual concept derived from the BMW M genes. Volkswagen gave free rein to their designers to explore the future of the iconic Golf GTI with the Golf GTI Vision Gran Turismo. The Alfa Romeo 6C Biposto Vision Gran Turismo, created by the team responsible for the Alfa Romeo 4C, will celebrate an iconic model from the 1930’s. A bold glimpse into the future, the Mercedes-Benz AMG Vision Gran Turismo unites sensual purity with classic Mercedes-Benz design elements. Nike makes an intriguing foray into automotive design, following the company’s collaboration with Polyphony Digital Inc. on the design of the revolutionary concept vehicle, Nike ONE for Gran Turismo 4. The cars will be released by Polyphony Digital from 2013 to 2014 as gifted downloadable content (DLC) to owners of Gran Turismo 6 through online update. Vision Gran Turismo has been developed as a ‘thank you’ to the franchise’s loyal fan base for its successful 15-year history. “This is a very exciting project,” explained legendary Gran Turismo creator and President of Polyphony Digital Inc. Kazunori Yamauchi. “Ever since we released the first Gran Turismo game 15 years ago, GT has resonated with the automotive world and we have enjoyed many different and fascinating collaborations. But Vision Gran Turismo is probably our most ambitious to date. It promises to provide a window into the future of automotive design that we can bring to life in Gran Turismo 6. We are extremely grateful to all of our design partners in this project for their amazing birthday present to Gran Turismo to celebrate the franchise’s 15 year anniversary, and are so excited to share this gift with our fans. Working closely with the leading lights of automotive design, as well as some design teams from outside of the industry, has been a rare privilege and we look forward to sharing their creations with fans of Gran Turismo from this year through to 2014”. The team at Polyphony Digital has a long history of innovative partnerships with manufacturers that underlines the breadth and depth of "the real driving simulator". Fascinating co-operations to date have included the Red Bull X2010 ultimate race car, GTbyCitroën concept, an innovative new GPS and data app developed for the Toyota GT86, and partnerships with Nissan that include Polyphony designing a display for the real Nissan GT-R and the highly-successful GT Academy virtual-to-reality racing driver development competition. Gran Turismo 6 will be released on 6th December, 2013. The game is already available for pre-order through a number of retailers. Those pre-ordering the GT6 Anniversary Edition or the standard edition will receive a number of additional cars when the game is released. "The Vision GT project offers a great opportunity to flesh out extreme ideas and portray the Volkswagen GTI’s design elements as vividly, dynamically and emotionally as possible. The further development of an unmistakable design and loving attention to detail reflect the high standards shared by the Volkswagen GTI product brand and Gran Turismo by Sony PlayStation. We look forward to creating a vehicle that gamers can use to gain unrivalled virtual experiences of the GTI world."